Matz is a rubber-bonded abrasive impregnated with abrasive particles. 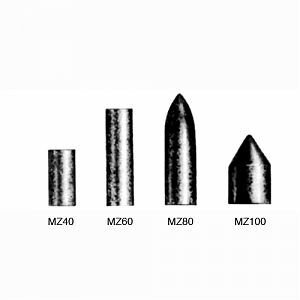 MZ40 Cylinder 1/4" 1/2" 1/16"
MZ60 Cylinder 1/4" 7/8" 1/16"
MZ80 Bullet 9/32" 1" 1/16"
MZ100 Bullet 3/8" 5/8" 1/16"
Maximum Safe Speed 25,000 rpm. Best results are usually obtained at 30% to 80% of Maximum Safe Speed. Use a light work pressure. Please select size code and grit below.